Okay. First off, let's just get this straight. 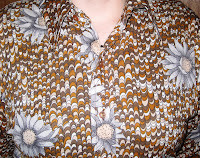 <-----This is an ugly shirt. That doesn't preclude that what comes of it shall be in any way ugly. I finished the two major canes that will be the basis of my piece for the Inspired by Fabric monthly challenge of PCAGOE (Polymer Clay Guild of Etsy).